The easiest way to create this file is to use the function Create template file outlined below in Steps to Create a Sample Tracking File. After you create a template, fill the Genotype column – this will usually be enough to create an appropriate sample tracking file to order the service. Please refer to the guidelines below and examples as a check list before submitting the file. Please note that Genotype Name can be any string of less than 100 characters long, uniquely identifying the sample. Please, observe the character restrictions mentioned below. Commas (,) Commas (,) must only be used to separate fields in the file. Do not use them inside any field (e.g. as a part of genotype name). Illegal Characters Other characters which cannot be used are: semi colon (;), single quote (‘) and double quote (“). Mandatory fields All fields must have values except for Species and Comments, which may remain blank. Species Name If there is any uncertainty with the Species Name, leave the Species Name column blank or place the Species Name in the Comments column and leave the Species Name column blank. 94 Sample Plates As we operate on 94 sample per plate basis, file cannot contain information for wells G12 and H12. Empty wells Only informative records should be left in the file. We WILL NOT ACCEPT files with records not representing legitimate samples, for example: BLANK, NA, WATER, TBA, ‘-‘ etc. Name Compliance Names of organisms and tissues have to comply with our requirements. Using the ‘Create template file’ function will assist in you in finding required values. If you can’t find entry you require, please contact us. Name Length Names of genotypes can be any string of less than 100 characters, unambiguously identifying the sample, observing the character restrictions mentioned above. Unique Combinations Each combination of PlateID, Row and Column has to be unique within the sample tracking file. 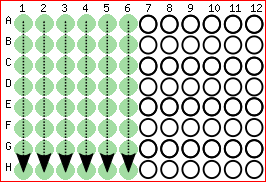 Organize your samples COLUMN-WISE starting from well A1 and on to B1, C1 etc. 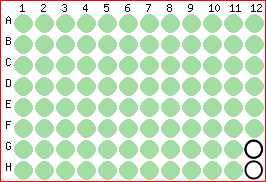 Once column 1 has been filled to H1, the next sample will go to A2, B2 etc. Any well(s) left without assigned sample MUST BE deleted from the sample tracking file. Please see picture below that illustrates correct organization of the samples in partial plate and comparison to fully filled plate. Make sure you comply with requirement Empty wells outlined above related to creation of the sample tracking file . 1. Select Download the Sample Tracking File Template button to save the file on your system. 2. Prepare the downloaded CSV file by adding your data: insert sample identifier into the Genotype column and optionally any note/comment into the Comment column. Refer to the Requirement Table and examples to assist with populating the data file which will help avoid validation errors on upload. 3. When ready to order, go to the New Order page. You may need to log back into Online Ordering. 4. Select the Product and add a Comment if required. 5. Select the Browse button to locate and select the file, then select the Upload button to complete the upload. The file will be checked for consistency and will define the order after successfully passing all tests. 6. Any validation errors encountered in the file will need to be corrected and saved then return to Step 3. For assistance with errors see examples of files can be found below: look in the Comments field of the examples for further tips and information. The following records are examples illustrating some of the common data errors. In each record the comments column describes the error. The following header row applies for each record.